In Columbia Pictures' "Salt,"Angelina Jolie" stars as Evelyn Salt, a CIA officer who swore an oath to duty, honor, and country. When she is accused by a defector of being a Russian sleeper spy, Salt goes on the run to clear her name and ultimately prove she is a patriot. Using all her skills and years of experience as a covert operative, she must elude capture and protect her husband or the world's most powerful forces will erase any trace of her existence. Liev Schreiber stars as Winter, Salt's boss and friend on the Russian desk at the CIA, and Chiwetel Ejiofor plays Peabody, a CIA counter-intelligence officer. Download Salt in Digital HD from the iTunes store. Salt images are © Columbia Pictures. All Rights Reserved. 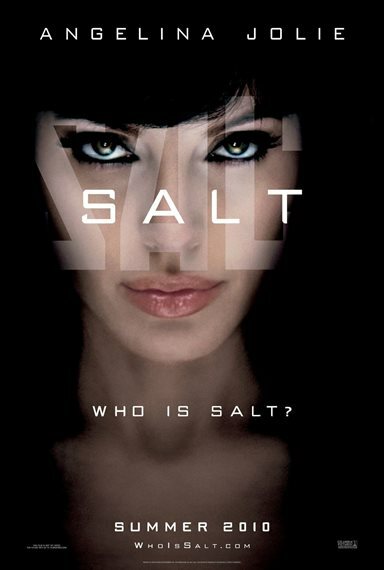 Salt may be a spy movie, but we begin by eschewing the spy movie form in favor of the slightly awkward introduction of plot device Mike (August Diehl, Inglourious Basterds), followed by headlong ascent into what seems to be a fugitive film. In pursuit of Salt (Angelina Jolie, Mr. and Mrs. Smith, A Mighty Heart) seem to be exactly the characters one would expect from such an enterprise, by-the-book fugitive hunter Peabody (Chiwetel Ejiofor, Serenity, Children of Men) and would-be Salt ally Winter (Liev Schreiber, Scream, Love in the Time of Cholera). Likewise, here is the improbable confluence of circumstances driving Salt to appear ever more guilty while trying to prove her innocence. We are fortunate, however, that Salt is unsatisfied with such an unremarkable premise. The film continues to venture into Salt's past with Mike, and it nearly abandons Peabody and Winter — roughly slicing off the trappings of the fugitive-film — in favor of an exploration of the underlying causes of Salt's motivations. It goes so far as to refute the goal of proving her innocence, such as it is, as necessary for satisfyingly concluding the film. For all this to work without giving away too much of the underlying force of the film, Salt's motivations, Jolie is forced to abandon the sympathy of the audience, demanding that we have faith that all shall be revealed. It is quite a feat, and accomplished successfully, but this skill is a little frustrating; one feels directed by the film not to question Salt's motives at times, as ambiguous as they may be. Nevertheless, it is a difficult situation — too far in the other direction and Salt would lose most of what makes her interesting — handled in the best way possible. This is not to say the circumstances of Salt's life are themselves subtle and complex, setting aside the requirement by the film's action that she be the best spy ever. She has simple wants and needs, and her life is full of human behavior and human reactions. It is most appropriate to juxtapose the resulting complex outcomes with the simplicity of causes, just what one would expect from observing a world in obedience to chaos. There isn't really running time to develop any of the other characters, but Ejiofor yet again injects intelligence and relatability into what would otherwise be an piñata for audience feelings. It is unfortunate that Schreiber could not similarly elevate Winter. The film also ends five minutes too late, probably thanks to audiences' desire for absolute conclusiveness. No matter, though: we have already become quite familiar with the principal player in this world, and Salt shouldn't help but be satisfied with that.